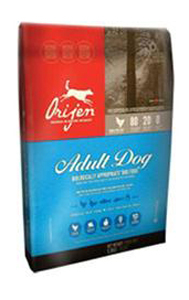 Orijen take as their premise that your dog is still, at heart, a wolf and therefore ought to be fed as a wolf. For this reason they label their food as Biologically Appropriate and it will appeal to those who have been feeding the Raw Food diet and fancy something a little easier to use! There is a range of foods for all ages, though at a high cost because of the ingredients used. There has been research recently that questions the idea of the domestic dog needing to be fed an ancestral diet, as their digestion has evolved over centuries of breeding and domestication to be able to digest the food that humans eat. Putting it simply, the successful wolves in the early days of human development were those who put aside their fear and began eating the scraps of food that humans discarded, lived close to human settlements and later more fully embraced the developing relationship between human and canine! 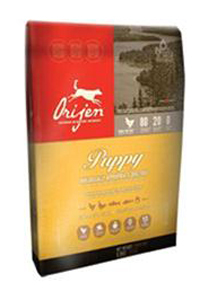 Orijen recipes are high in meat content, so high protein. They are also low carbohydrate, fitting in with the principles of BARF and raw feeding! If the philosophy behind the product meets your needs then this is worth trying. However, at between £64 - £70 for a bag it is a very expensive outlay compared to more traditional natural foods. Fresh chicken (boneless) (20%), dried chicken meat (15%), fresh chicken liver (4%), fresh whole herring (4%), fresh turkey meat (boneless) (4%), dehydrated turkey meat (4%) fresh turkey liver (3%), fresh whole eggs (3%), fresh boneless Zander (3%), fresh whole salmon (3%), fresh poultry hearts (3%), chicken cartilage (3%), dried herring (3%), dried salmon (3%), poultry liver oil (3%), poultry liver fat (2%), red lentils, green peas, green lentils, alfalfa, yam, chickpeas, pumpkin, butternut squash, spinach leaves, carrots, red delicious apples, Bartlett pears, cranberries, kelp, licorice root, angelica root, fennel, calendula flowers, sweet fennel, peppermint leaf, chamomile, dandelion, summer savory, rosemary. Additives: Vitamin A (15,000 IU/kg), vitamin D3 (2000 IU/kg), iron (40 mg/kg), iodine (3 mg/kg), copper (13 mg/kg), manganese (14 mg/kg), zinc (150 mg/kg), selenium (0.3 mg/kg). Fresh chicken (boneless) (22%), dried chicken meat (15%), fresh chicken liver (4%), fresh whole herring (4%), fresh turkey meat (boneless) (4%), dehydrated turkey meat (4%) fresh turkey liver (3%), fresh whole eggs (3%), fresh boneless free Zander (3%), fresh whole salmon (3%), fresh poultry hearts (3%), chicken cartilage (3%), dried herring (3%), dried salmon (3%), poultry liver oil (3%), red lentils, green peas, green lentils, sun-ripened alfalfa, yam, pea fibre, chick peas, pumpkin, butternut squash, spinach leaves, carrots, red delicious apples, Bartlett pears, cranberries, kelp, licorice root, angelica root, fennel, marigold flowers, sweet fennel, peppermint leaf, chamomile, dandelion, summer savory, rosemary. Additives: Vitamin A (15,000 IU/kg), vitamin D3 (2000 IU/kg), iron (40 mg/kg), iodine (3 mg/kg), copper (13 mg/kg), manganese (14 mg/kg), zinc (150 mg/kg), selenium (0.3 mg/kg).